Our Brown Sugar Shortbread Cookie Mix bakes up into addictively good shortbread cookies. Shortbread fans know that the proper combination of sugar, butter and flour becomes something magical, and these cookies are that and more. We chose a brown sugar base for this mix and you will add a dash of vanilla to the dough, resulting in cookies with a warm and rich flavor. 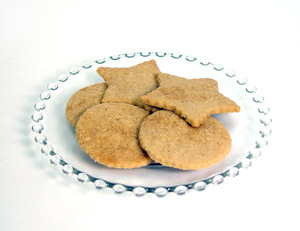 You can bake our brown sugar shortbread cookies in a variety of ways. For classic wedge-shaped cookies, you can bake a single recipe in a tart pan, and cut them into wedges after baking. You can press the dough into traditional shortbread molds and bake. Finally, you can roll the dough thin, cut it out with shaped cutters, and bake the cookies as thin wafers (MY personal favorite!). While shortbread cookies can be served plain or ungarnished, you can also get creative with your cookies. Dip the baked wedges in molten chocolate and then with crushed nuts or toffee bits. A very simple finishing touch is to simply sprinkle the unbaked dough with cinnamon sugar prior to baking. Each bag contains 2 complete recipes. . Each recipe makes 2 1/2 dozen wafer cookies, or one tart pan (15 wedges). Are you expecting a crowd? Bake both recipes and watch them disappear!